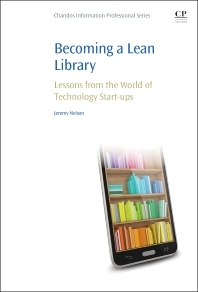 Becoming a Lean Library: Lessons from the World of Technology Start-ups provides a guide to the process and approach necessary to manage product development. Using techniques and philosophies pioneered by Toyota's lean manufacturing success, Becoming a Lean Library provides library leadership advice and tips on making the library more nimble, lean, and responsive to technological change. Early chapters introduce the reader to the idea of lean start-ups in libraries, followed by chapters covering library systems, lessons from lean manufacturing, and the build-measure-learn model. Remaining chapters discuss technology change and DevOps as a lean strategy, while also giving the reader the opportunity to earn a professional online "badge" on the subject material of the book. Library administration responsible for the success of library technical services and systems, graduates and researchers in the area of lean start-up and technical project management. 4.1. What is an OODA Loop? 6.1. What Is a Hypothesis? Jeremy Nelson is the Metadata and Systems Librarian at Colorado College and the project leader of the open-source Redis Library Services Platform. Prior to becoming a librarian, he worked for a variety of different sized software companies in the financial services and online education markets. His interest in applying successful software management techniques to libraries started in graduate school at the University of Illinois and continued through his professional positions at academic libraries.